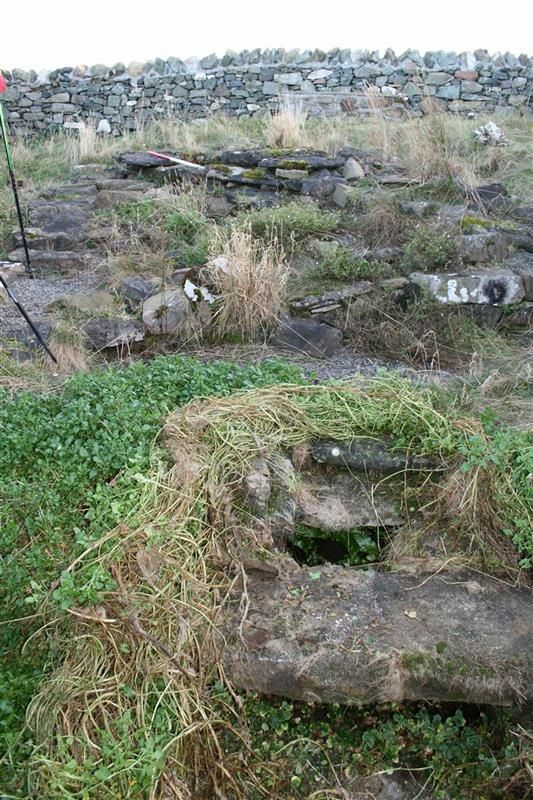 A well preserved holy well lies beside the site of an early chapel at Ashaig on Skye. According to local legend, the chapel was at a ferry crossing for St Maelrubha, to his monastery at Applecross. Today nothing remains of the chapel, although there is a raised mound. The well was cleaned out and reconstructed by Martin Wildgoose and George Kozikowski in the 1990s. A diverse array of finds were discovered, including a Neolithic axehead, bones, slag, pottery, clay pipe fragments and modern glass. The finds are currently in Skye and Lochalsh Archive Centre. The work showed that the stone-built well-house was fed by a channel from an earlier stone-lined spring. Neaby to the well-house a cross-marked stone was also found. There has clearly been activity at the site for millennia. A substantial shell midden was found between the well and chapel site by the Scotlands First Settlers Project. Later there had been metalworking taking place here, dated by radiocarbon dating to the 13th century AD, and providing important information on medieval settlement on Skye. A decorated strap end found nearby probably dates to the 11th century, again showing medieval activity here (see ARCH Find of the Month February 2012). Holy wells are found throughout the Highlands. Some were visited only on certain days or were considered effective for only certain ailments. In many cases they are thought to date to pre-Christian periods, being absorbed later into Christianity. However, dating is often difficult, especially since they are used over a long period, as is the case here.